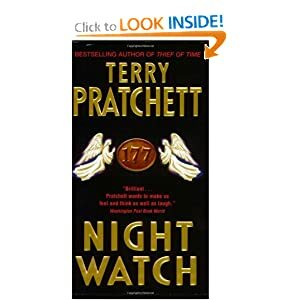 Night Watch is the 28th book of Terry Pratchett ‘s DiscWorld Series. The 28th addition to Pratchett’s “Discworld” series explores time travel and historical inevitability with cleverness and humor. The author’s talent for comedy does not falter as he continues to set the standard for comic fantasy. Terry Pratchett is one of best British Comedy novel writers. I have read around 15 Discworld novels and love those all. These books are really fun to read. Sam Vimes, Commander of Ankh-Morpork’s City Watch, can’t complain. He has a title, his wife is due to give birth to their first child any moment and he hasn’t had to pound a beat in ages but that doesn’t stop him from missing certain bits of his old life. Thank goodness there’s work to be done. Vimes manages to corner a murderer, Carcer, on the library dome at Unseen University during a tremendous storm, only to be zapped back in time 30 years, to an Ankh-Morpork where the Watch is a joke, the ruling Patrician mad and the city on the verge of rebellion. Three decades earlier, a man named John Keel took over the Night Watch and taught young Sam Vimes how to be a good cop before dying in that rebellion. Unfortunately, in this version of the past, Carcer has killed Keel. The only way Vimes can hope to return home and ensure he has a future to return home to is to take on Keel’s role. Night Watch has most of usual DiscWorld characters, but this time story tells us about their early days. ‘young’ Vimes, Fred Colon as a corporal, Nobby Nobbs as a street urchin, Reg Shoe as a non-zombie revolutionary and a young new street vendor named Dibbler just starting out. It was to read this book. Reminds you the movie “Back to the Future”.